Well, I’m technically not starting today, but this is my first post about it, and I’ll be updating every Friday. I’ve decided that I’m going to try going without shampoo or “no ‘poo” as they’re calling it. I’ve been hesitant, but after several months of my hair looking and feeling like crap and the commercial hair products failing me, I feel like I’ve got nothing to lose. I want my gorgeous hair back, and from most reports, this will do that for me. If nothing else, this will save me money for a few months. So there I am in all my makeup-less, unstyled glory. [grins] Sorry for the funny face, the sun was too bright for even the shades to combat. 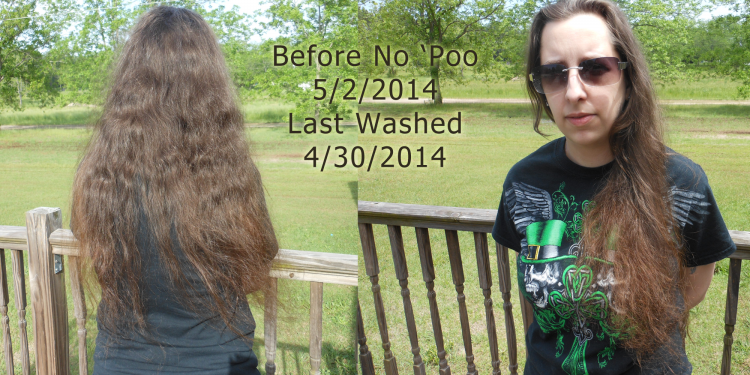 As the photo indicates, today is 5/2/2014 and the last time I washed my hair was 4/30/2014. I usually wash my hair on Wednesday and Sunday. As usual, the top of my hair is kind of oily and the bottom is like straw. My hair has gotten more and more frizzy and dry over the last few months. I have no idea why, and none of the shampoos, conditioners or treatments have helped. I even tried Garnier Fructis Sleek Shine Anti Frizz Serum and some placenta treatment. It didn’t get any better. I’m ready for a change. I know there’s a transition period when doing the no ‘poo thing, but I’ll deal if there’s a chance that it will make my hair soft, smooth and nice again. So the idea behind the no shampoo thing is that you wash with diluted baking soda and rinse with diluted apple cider vinegar. The proportions are 1 tbsp of baking soda or vinegar per cup of water. Some ladies go as far as 50/50, but most people say that those people are insane. I’m going to tweak my mix a little too. I did a lot of reading and decided that I’m going to add some organic honey to the shampoo and a few drops of scented oil to both. I have some good orange oil and that scent will go nicely with my other natural products. I also have some vitamin E oil and coconut oil on hand in case I have really dry hair days. I’ve already discovered that vitamin E oil blows Fructis Anti Frizz and John Frieda Frizz-Ease out of the water, and it’s not made of crazy chemicals. Oh, and for those wondering, you can not mix the baking soda and vinegar to make yourself a Pert 2-in-1 substitute. Trust me on this. 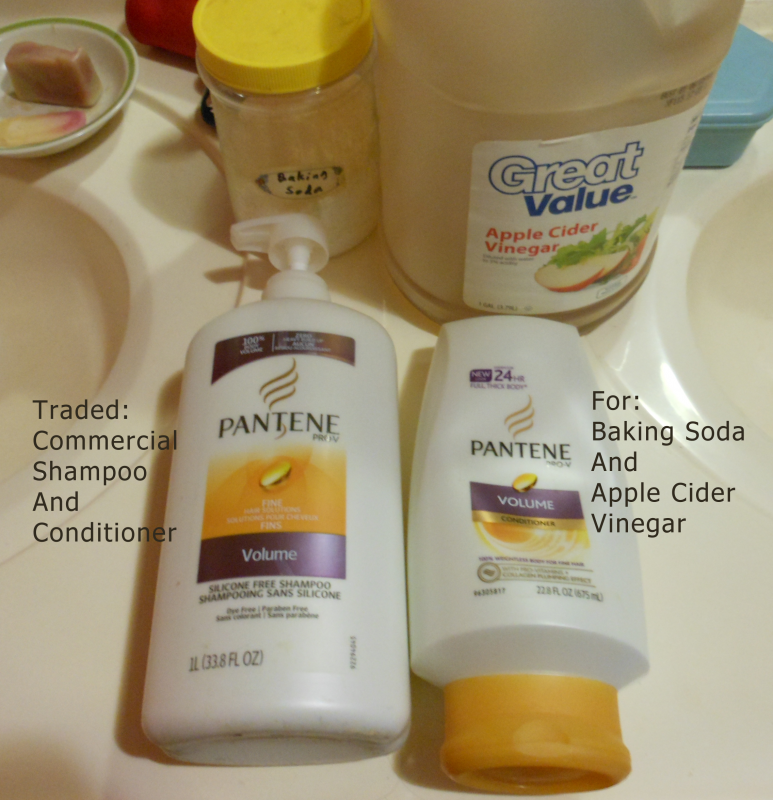 I use baking soda and apple cider vinegar to clean my drains because the chemical reaction eats through hair. You don’t want that on your head, unless you’re looking for a shortcut to going bald. There’s a reason all the tutorials out there say to rinse between the two. Overall though, this ought to be easy. I’ll have to get used to not having that silky-foamy feeling all over my head, but I’m sure I can manage. I don’t get mega-froth with my new soap like I did with body wash, but the difference in my skin makes it worth it. It’s just something to get used to. 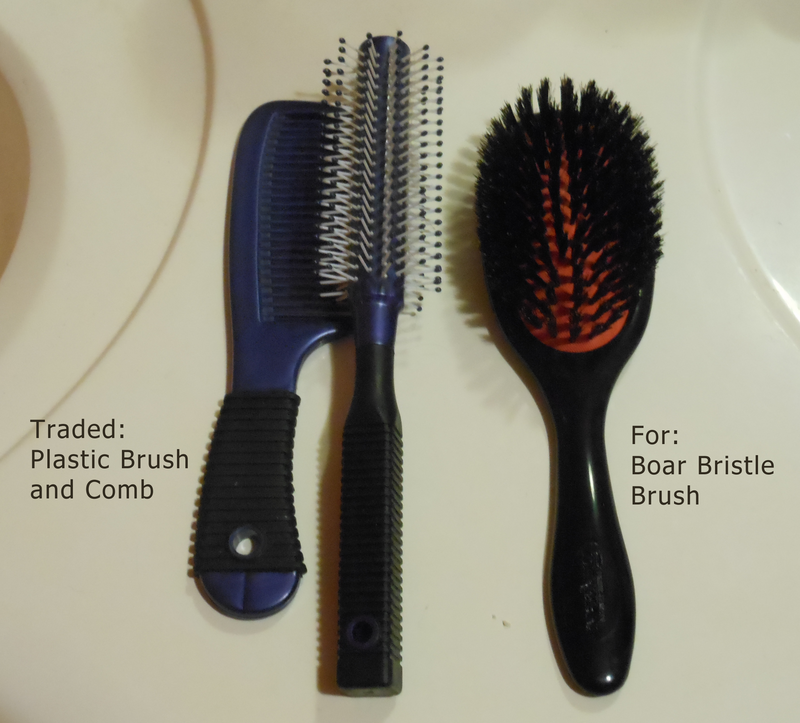 Another part of this process is that I’m giving up the plastic comb and brush for a natural boar hair brush. It’s supposed to distribute the oils better and help make your hair amazing. I bought the brush at Christmas and tried using it for a while, but it made my hair seem greasy so I quit using it. I didn’t know at the time that like going no-shampoo, using a natural brush has a breaking-in period for your hair. It will get greasy at first, but then it gets better. I figured if I was going to do this thing with my hair, I’d do it all at once so there wouldn’t be two transition periods, so I broke the brush back out. I spent $15 on the bloody thing, it ought to get some use. Hopefully the combination of the brush and no ‘poo will give me back my great hair. I’d really love that. Check in next Friday for a new photo and update. A lot of people swear by it. I know the “beauty” industry wants to keep us hooked on their products, but I’m all for saving money and being more natural. We’ll see how it goes!